The Indian Premier League (IPL) in India has earned a prominent spot in Indian household and today, Social Medias (especially twitter) have changed the way Indians watch Cricket!! Cricket is always a loved sport in India and IPL matches have added more fascination to the game. With huge fan following, cricket has become a community affair, watched and enjoyed with friends and family. What was once only watched on television, took root on social media through internet communities by offering live sports experience. With the ever increasing adoption of Social Media every sport nowadays is either turning online or being influenced by online medias. Hope you would’ve read our previous post, how the power of social media saved our traditional sport Jallikattu and gave it a new identity. Here we talk about the influence of twitter on the most cherished IPL. With nine out of ten Twitter users are fans of Cricket, Twitter comes up with some exciting features every year that earns the cricket lovers’ credit. Making itself the biggest entity in the game of cricket, twitter evolves from text to images to videos and making every IPL match a top tweet in Indian twitter trends. Their tactics attracts more audience making the already famous IPL to grow as a mammoth among the masses. No wonder that twitter earned billions of impressions over the last few IPL seasons. Mentioned below is a brief rundown of how twitter played-out in attracting cricket admirers into its spell, making the talk of cricket everywhere. Ever since the beginning the IPL matches in 2008 twitter has played its part in publicizing it through fan posting. However, the dedicated involvement of twitter with the sport of cricket started in the year 2012. Back then Twitter had created a devoted page for ICC T20 in 2012 and partnered with IPL 2013. 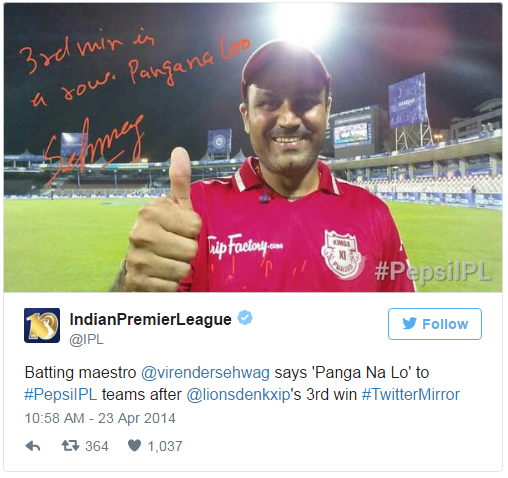 From then on, while the excitement on the field soared, the public conversation around the IPL on Twitter too soared. Twitter made cricket more interactive in the year 2013. The introduction of Twitter Magic Mirror made celebrities and cricketers to tweet pictures frankly with the audience through their official twitter account with just a click. The Discover Page allowed users around the world to easily sign up into twitter account and enter the IPL conversation grouped under several categories, i.e. there were separate groups for IPL leadership, IPL Team Owners, IPL Partners, IPL teams and their players. With this option twitteraties were able to follow their favourite cricketers, teams, personalities, celebrities and more. Twitter Hashtag Battle made things interesting for the cricket fans. While the teams fought in the fields the fans Hashtag their favourite team to win in popularity. Live tweet counter introduced by twitter kept conversation alive while the match was still being played. The countdown section on Twitters homepage ranked the IPL teams based on the fans talking about them on twitter. This feature helped fans track the popularity of their favourite team. Other interesting twitter activities were “Join the #PepsiIPL conversation”, “Today’s Social Buzz”, and the “Latest Tweet” section. Twitter introduced real time initiatives such as Twitter IPL Calendar, #IPLMagic, IPL Pulse and much more in 2014 IPL. Tweeting to @IPL with #Calendar from your mobile, one can choose to receive calendar notifications for IPL matches of your choice, 10 minutes before the start of each game. 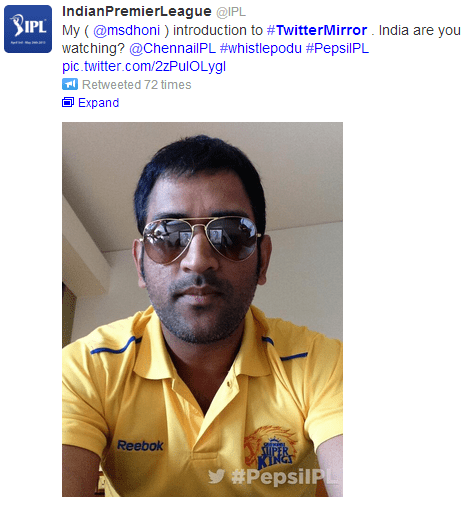 Signature-enabled #TwitterMirror made its debut in IPL 2014. Twitter introduced selfie section which enabled fans to take live shots of them being in the stadium or meeting up with a celebrity and tweet with #IPLSelfie. With #MagicMoment fans received a personalized photo message with an iconic image. 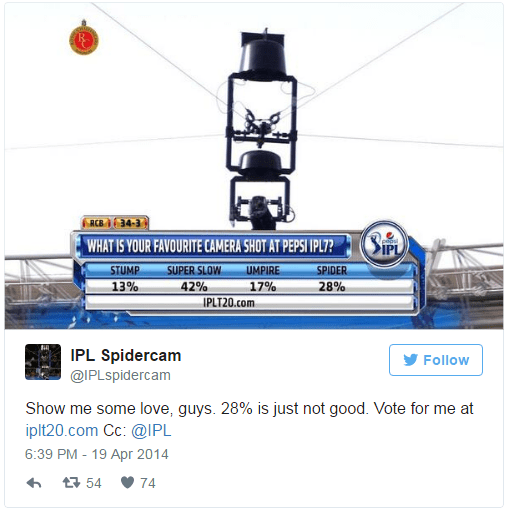 Twitter launched @IPLSpiderCam to get the exclusive behind-the-scenes content from the IPL. Other than this there were features like #playerbattles, which allowed fans to vote for their favorite cricketer. 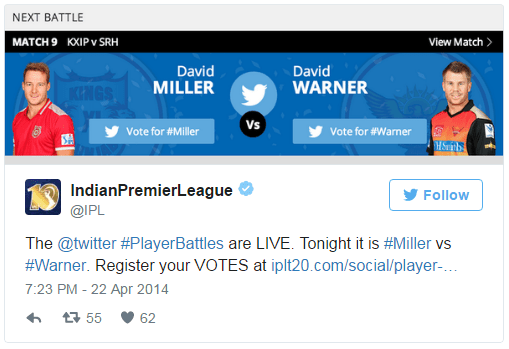 Twitter created special cricket timelines for #IPL2015. It became a one stop platform for cricket tweets, commentary, expert analysis, plus photos, videos, and Vines from the sidelines at the world’s biggest cricketing events. Missed call and match updates was a boon to fans as they could get match updates on their mobile phone without an internet connection. Fans were able to follow all the conversation from before the start of the season right to the end with the #IPL Cricket Timeline. It had the latest scores, commentary, photos and more. Twitter introduced official IPL Hashflags for each teams. The official hashtags for Hashflags are #IPL, #CSK, #DD, #KKR, #KXIP, #MI, #RCB, #RR and #SRH. The IPL Tweet Wall of Fame created a buzz by showcasing a best tweet by fans with #PepsiIPL in the live global TV broadcast of every match. IPL Videos on twitter was introduced to make sure that fans were abreast of all the happenings of the IPL. Twitter used Periscope to live stream events. Periscope facilitates the building of a more intimate relation with the fans on Twitter. It not only covered all that is telecasted in traditional broadcast, but also interesting incidents such as team practice sessions and behind the scenes happenings. Real time Q&As were made possible where fans were able to watch and type in questions to their favourite players and commentators as they engage with them from the IPL Periscope account. IPL #OrangeCap and #PurpleCap allowed fans to create their own leaderboards by using #PepsiIPL and # or his Twitter handle. Twitter increased the number of tweeted videos in 2016. There were 32 times more videos in 2016 than the previous year and video views growing 64 times over 2015 for the league stage. Another interesting feature was creating a Twitter Moment that showcases the very best of what’s happening on Twitter. Twitter created a twitter moment especially for the finals between Sunrisers Hyderabad (@SunRisers) and Royal Challengers Bangalore so fans could discover what is happening in an instant. The conversation of the final match became wide spread with throughout the nation through Twitter Moments. No doubt that IPL is one of the top Hashtag trends of 2017-twitter, it all started right from the IPL auction moment like “Twitter set ablaze with over 230K tweets on the IPL auction for 2017”. Whatever be, the success of one reflects on the other. #IPLAuction topped worldwide trends on Monday, February 20, across social media websites and platforms. Cricket fans just could not stop talking about record-breaking purchases. Also now twitter launched special emojis for 30 cricketers. IPL 2017 went exciting during the final moments. IPL fans were very vibrant in twitter during the heart-stopping match that held between Pune and Mumbai and kept us eagerly on the edge of the seat till Mumbai Indians won the title IPL 2017 by just a single run. But spotlight of the camera was regularly falling on a elderly women who was praying fervently as the IPL final entered the crunch last over. It was none other than Purnima Dalal, mother of Mumbai Indians co-owner Nita Ambani and that was confirmed by none other than actor Abhishek Bachchan. That is Mrs. Ambani’s mother. Popularly referred to as “nani”. The lucky charm. Dalal left Twitterati amused and touched and there was an outpouring of tweets as her face was flashed on television screens. As they say, never underestimate the power of prayer! Though IPL 2018 hasn’t yet started, the comeback of CSK (Chennai Super Kings) after two years has cheered audience and created a big stir in twitter. This return and the official signing of the Ranchi Stumper, Thala Dhoni, Chinna Thala Raina and Royal Navghan Ravindra Jadeja, are going viral in twitter platform with the Hashtags #ReturnOfTheSuperKings #SummerIsComing #WhistlePodu and many more. CSK lovers are much awaited to see their captain M.S. Dhoni in his favorite yellow jersey and play in his ‘spiritual home’, Chennai as well. Fans show a great reception in twitter, tweeting ‘Thirumbi Vandhutom nu Sollu’. Besides, Rajasthan Royals also joins this year IPL after a two-year ban. Undoubtedly this year too IPL will create a buzz in twitter among the IPL fans. Looking at all the above we can say that innovation can go a long way in driving fans to stay connected to the IPL on Twitter. There may still be more improvement in the future with even greater growth. Whatever be, the success of one reflects on the other. Let’s look forward to what’s new is on the brink this season. Cricket is always a loved sport in India and IPL matches have added more fascination to the game. With huge fan following, cricket has become a community affair, watched and enjoyed with friends and family. What was once only watched on television, took root on social media..
Hope thi season going entertainment is going on!!! !